HighliteswithIk celebrates its 100th episode this Friday! 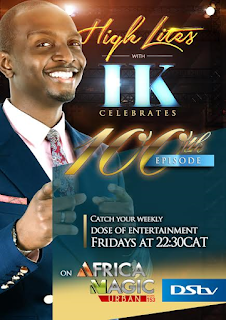 Africa Magic’s hit talk show HighliteswithIk marks its 100th episode on Friday the 14th of October. The show hosted by uber talented IK Osakioduwacombines fun, laughter, amusement with the right amount of education. HighliteswithIK has already featured some of the best names in showbiz such as Funke Akindele, MI, Basket mouth, Chigurl, Beverly Naya to name but a few. On this special episode, we have as our guest TUFACE IDIBIA! You don’t want to miss out!